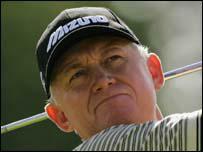 Roger Chapman has been a regular fixture on the PGA European Tour for nearly two decades. He achieved a most successful amateur career, representing Great Britain and Ireland in the Walker Cup in 1981 and England at every level, and winning the English Amateur Champion title. His immensely respectable and consistent golfing record was crowned by winning the Brazilian Open in Rio de Janeiro. This became the start of a very special year. Not only was this his first European tournament win in 19 years , he also represented England in the Dunhill Cup, achieved his first hole-in-one as a Pro and signed off a glorious season by winning the prestigious King Hassan II trophy in Morocco in November. Roger won the Zimbabwe Open in 1988, has attained an incredible twelve second place finishes worldwide and has no less than 53 top ten finishes, playing in over 475 tournaments. Roger has become a most distinguished and well-liked member of the Tour. His fellow golfers voted him onto the Player's Tournament Committee in 1995 and every subsequent year since. He has shown the value of his experience on this Committee as a leading voice in many positive decisions which have enhanced the standing and extensive growth of the Tour.